The EU Sustainable Energy Awards recognize outstanding innovation in energy efficiency and renewables. This year, finalists were chosen from 96 applications which competed against each other to receive the much-desired confirmation of their contribution towards citizen´s centric accomplishments for a clean, secure and efficient energy. 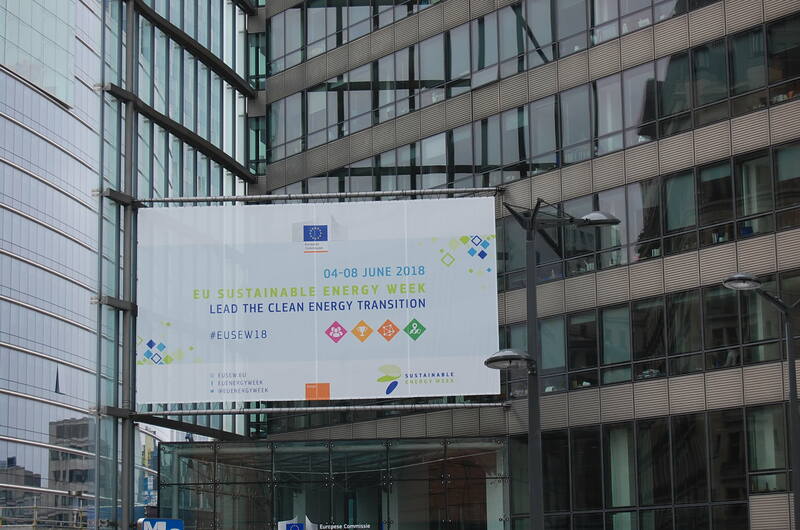 Regardless of status, location or funding source, anyone from EU could submit a recent project – from a local initiative to an industry-wide programme – that could help citizens, business and the public sector work towards the Clean Energy targets. These are as of 2017, even more ambitious and binding on an EU level. A binding 30% EU energy efficiency target for 2030 emphasizes EU commitment towards its international and climate and energy goals for 2030 and beyond. To achieve these goals, society needs a clear and an ambitious vision translated into effective regulation firstly, but secondly, end-user solutions and products which produce energy savings at the bottom level. 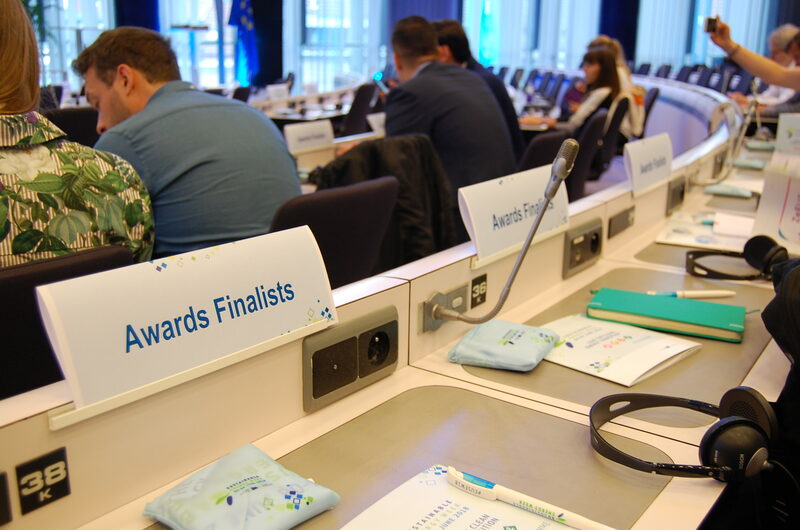 12 finalists with their representatives were invited to join the Award ceremony which took place in the Charlemagne building of the European Commission in Brussels on 5th of June 2018. WISEGRID – TOOLS FOR A SMARTER GRID:The products of this project include platforms for monitoring and managing infrastructure, applications to support smarter energy use, tools to optimise electric vehicle charging and supply renewable energy, as well as services for marketing unused generation capacity. They target consumers, ‘prosumers’ (people who produce and consume energy) and electric vehicle fleet operators, among other groups. Learn more about the project here: https://www.wisegrid.eu/ and follow them on Twitter here: https://twitter.com/WiseGRID_H2020. INFINITY BUILDING – A LOW-COST SUSTAINABLE BUILDING: Infinity is a privately-funded idea of a building that combines unique sustainability goals with a limited budget.Infinity produces its own sustainable energy with solar panels and its own wind turbine. Through an ingenious combination of geothermal energy, the heating and cooling system has reduced its energy consumption by 70%. Learn more about the project here: http://www.infinity-building.be/ and follow them on Twitter: https://twitter.com/Infinity_build. RESCOOP PLUS – A NEW FOCUS ON ENERGY SAVING: This project helps renewable energy cooperatives (REScoops) to go beyond producing and supplying energy to making sure that energy is saved at the same time. REScoop is short for renewable energy cooperative, and refers to a business model where citizens jointly own and participate in renewable energy or energy efficiency projects. REScoops do not necessarily have the legal statute of a cooperative, but rather distinguish themselves by the way they do business. It is being implemented in eight European countries – Belgium, Denmark, France, Greece, Italy, Portugal, the Netherlands and Spain and therefore promises to create a wide geographical impact. Learn more about the project here: https://www.rescoop.eu/ and follow them on Twitter: https://twitter.com/RescoopPlus. 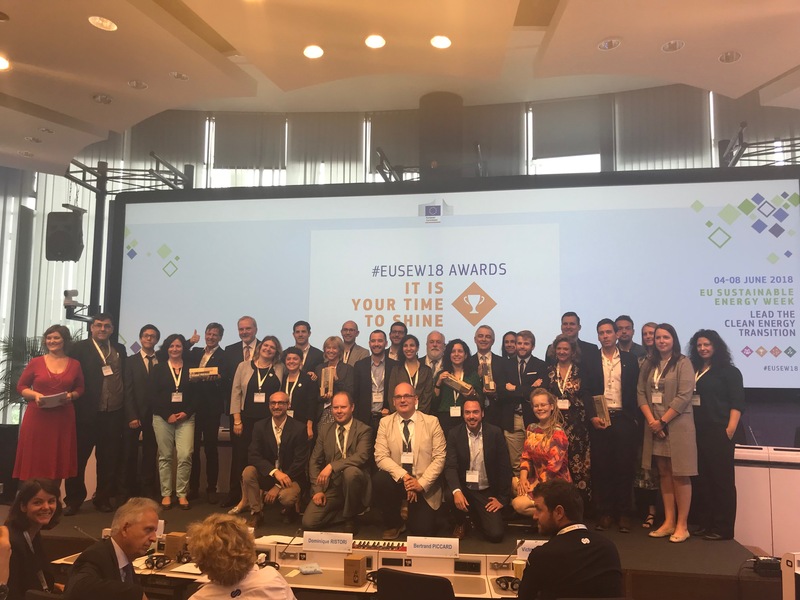 Winner of the EU Sustainable Energy Award in this category: WISEGRID. KARISE PERMATOPIA – ECOVILLAGE: Permatopia, the 30-hectare eco-village at Karise, south of Copenhagen, developed in accordance with renewable energy, recycling and self-sufficiency principles. It has 90 houses built using renewable materials to rigorous energy efficiency standards and a farm that supplies produce for residents. Permatopia’s cooperative community model, with good railway connections to Copenhagen, is proving attractive, with some 200 people on a waiting list for houses. Learn more about the project here: http://www.permatopia.dk/. BIO.ENERGY.PARC.SAERBECK – RENEWABLES COMMUNITY: In 2011, the municipality of Saerbeck took over the 90-hectare site of the former ammunition storage facility Saerbeck and developed the bioenergy park (BEP Saerbeck) exclusively with local investments at the area. So far (as of June 2017), 70 million euros have been invested generating electricity for 19,000 households from wind, sun and biomass. The park has a capacity of 29 megawatts – over twice as high as local demand – and a third of the site is devoted to nature conservation. Learn more about the project here: https://www.klimakommune-saerbeck.de/city_info/webaccessibility/index.cfm?item_id=869741. OUR PROJECT PEAKAPP – HOUSEHOLD ENERGY ADMINISTRATION APP: PEAKapp is an attractively designed, user-friendly mobile application that includes 8 functions, which can be downloaded on the user’s smart phone. Users can check their energy use at a glance, receive warnings about exceeding their consumption targets, obtain information on available discounts based on renewable energy production, and compare their energy consumption with similar households in the area. The App even includes a PEAKPoker game that allows individuals to place bets on their daily consumption, with rewards for conscientious behaviour. These features together motivate users to change their habits and save energy. It is applicable to all European residential users equipped with smart meters and an estimated 80% of EU households will have smart meters by 2020. 300 SCHOOLS ENERGY RETROFIT PROGRAM – PARIS: Schools have a prevailing influence on raising children into young adults who act responsibly towards energy and are therefore an ideal place to start. Paris is working on fitting new technologies in old buildings and with its implementation of energy efficiency measures at 300 schools between 2011 and 2020, the ‘300 schools energy retrofit’ programme is enabling the education sector in Paris to lead by example.The aim was to reduce energy consumption and greenhouse gas emissions by 30%. But in over 100 schools for winter 2015-16 these rates were reduced by 38.1% and 40% respectively, compared with 2008-09 levels. Learn more about the project here: https://www.paris.fr/. PEACE_ALPS – POOLING ENERGY ACTION PLANS AND ENHANCING THEIR IMPLEMENTATION IN THE ALPS: Peace_Alps is an Interreg Alpine Space funded project which addresses the problems related to the implementation of Sustainable Energy Action Plans (SEAPs) or any other Energy concepts already endorsed by Local Authorities (LAs) in Alpine Space Area by supporting LAs in developing concrete actions with an inter-municipal approach. Involving more than 200 municipalities in Austria, France, Germany, Italy, Slovenia and Switzerland, it is collecting and analysing energy data and implementing energy management activities. Learn more about the project here: http://www.alpine-space.eu/projects/peace_alps/en/about . 10 YEARS OF NORTH-WEST CROATIA REGIONAL ENERGY AGENCY – A SUCCESSFUL ENERGY PARTNERSHIP: REGEA shows what can be achieved if cities and regions work together. Among others, the agency is involved in large-scale projects, such as construction of the national children’s hospital and renewal of Zagreb’s street lighting. In 2016, it launched croenergy.eu, a crowdfunding platform for energy efficiency, renewable energy and environmental protection actions. Each year, REGEA is achieving an estimated 17.5 gigawatt hours (GWh) in energy savings – that’s the equivalent of power from roughly 2 billion LED lamps! L’ECOVIGILESSA VANESSA (VANESSA, THE ECOPOLICEWOMAN) – CREATING RESPONSIBLE ENERGY CONSUMERS OF TOMORROW: The character of Vanessa – the eco-policewoman teaches children how to take care of the environment through role play, competitions and interactive lessons. The children are given the chance to become environmental police officers and win sustainable prizes. Each participant is tasked with monitoring the behaviour of the adults around them and giving them a ticket when they do something good for the environment, such as saving energy or water, or sorting waste correctly. The adult signs the ticket and the child brings it back to school ready to take part in a meeting with Vanessa – the eco-policewoman –, who collects the tickets and plays environmental games with the children. Learn more about the project here: http://www.h2opiu.org/. Winner of the EU Sustainable Energy Award in this category: CZECH SUSTAINABLE HOUSES. Even though our project did not receive an award, we certainly have not left empty-handed. Being a finalist among other projects of such high quality, impact potential and contribution to energy saving, is a prestigious honor. 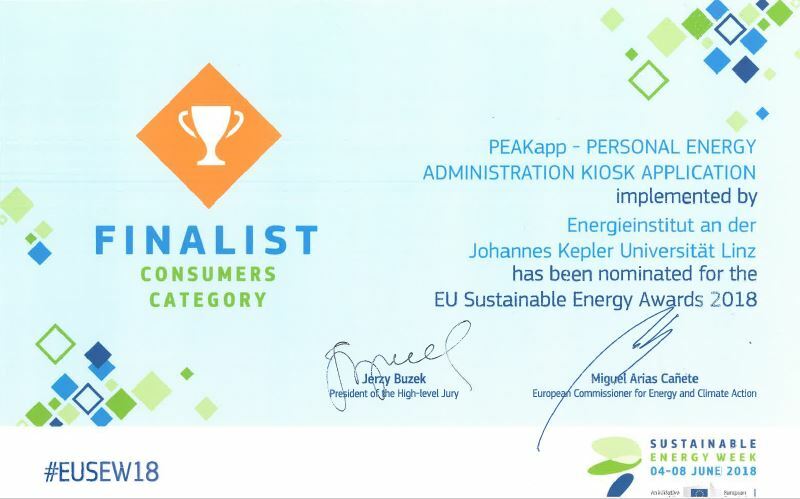 PEAKapp would like to thank the EUSEW18 team for organizing this competition and an excellent event which provided us with exposure and recognition. Motivation to continue with our work and deliver impact is now even higher!